The Nordic Orion is a Danish owned bulk carrier. In 2013, they were the first bulk carrier to travel through the Northwest Passage. However, the large vessel relied on a durable icebreaker, which was the Canadian Coast Guard’s Louis St. Laurent. 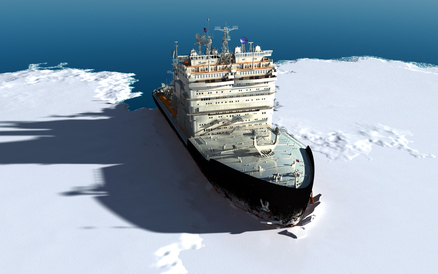 The Louis St. Laurent escorted the shipping vessel through the Arctic by making a path through the ice. Canada is currently undergoing a large debate surrounding the potential of increasing arctic shipping. Some cargo shippers are planning on increasing their trips through the Northwest Passage. This debate stems from an article that was published in the journal Climate Change. Researchers, from Environment Canada and the University of Ottawa, studied the patterns of arctic shipping from 1990 to 2012. Their analysis concluded that there was an increase in shipping during the summer seasons for the past twenty years. Additionally, this increase boomed in the past 10 years. The main reason for the increases in arctic shipping is not due to resource development or major cargo transports, but from small increases in community resupply vessels and fishing shipments. The result of this study shows that the boom in arctic shipping is not necessarily from climate change, but is a result from an increase in Canadian tourism. More people are wanting to experience Canada’s landscapes and cultures, which is great news for Canada. Some of the increase may be due to climate change. The group’s study found that the shipping season is getting increasingly longer, which includes transporting cargo. There were findings of considerable increases of shipping during the months of June and November. Those are the same months that show the biggest decrease in sea ice. The study that was conducted by the University of Ottawa showed some shipping increase is due to climate change, yet not as much as expected from them or from various climate change groups. People visiting Canada, construction, communities resupply and research exploration activities are the main reasons for the boom in arctic shipping. Also, an increase in cargo tankers, oil shipping and transportation of goods is expected. The increase will not only be from Canadian shippers, but also from international shippers from Russia and those heading to the EU. There is some debate about the Northwest Passage being a Canadian owned or internationally owned waterway. Either way, it looks like Canada owns it right now. Plus, it creates career opportunities for Canadians. People are needed to police the marine corridors for ships that seem to unintentionally find their way into the Northwest Passage, instead of staying within their own corridor. Also, new icebreakers will need to be built to keep up with the increasing demand. The marine corridors will need to be maintained for safety reasons. This will be a positive investment for Canada, which is already generating a large variety of benefits.